The amount of nutrients, rather than the amount of calories, may determine the nature and intensity of hunger – thus helping to explain the paralleled increases in rates of obesity, chronic disease and fast food consumption. Dr. Joel Fuhrman and his team undertook a study to discover what differences exist in the experience and perception of hunger before and after participants shifted from their previous usual diet to a high nutrient density diet. The following is a precis of the research interspersed with my comments. Apologies in advance for frequent repetition of key aspects, but the study itself expressed and re-expressed what appeared to be similar points but with subtle variations and additions. This was a retrospective, non-controlled, descriptive study conducted with 768 participants primarily living in the United States who had changed their dietary habits from a low micronutrient to a high micronutrient diet. 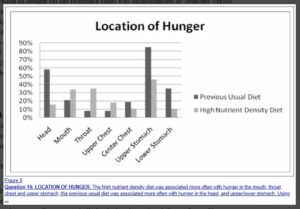 Hunger was not an unpleasant experience while on the high nutrient density diet compared with the low nutrient density diet. 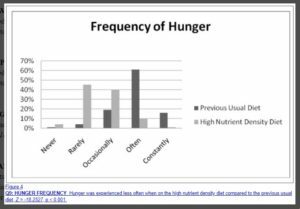 Hunger was well tolerated in the high nutrient density diet and occurred with less frequency even when meals were skipped. 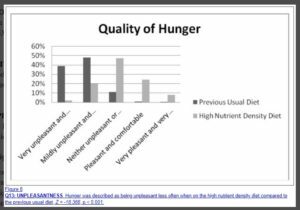 Nearly 80% of respondents reported that their experience of hunger had changed since starting the high nutrient density diet. 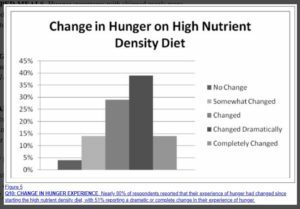 51% reported a dramatic or complete change in their experience of hunger from their normal diet to the high nutrient density diet. Hunger is one of the major impediments to successful weight loss. It’s not simply the caloric content, but more importantly, the micronutrient density of a diet that influences the experience of hunger. A high nutrient density diet, after an initial phase of adjustment during which a person experiences “toxic hunger” due to withdrawal from pro-inflammatory foods, can result in a sustainable eating pattern that leads to weight loss and improved health. A high nutrient density diet provides benefits for long-term health as well as weight loss. The results have important implications in the global effort to control rates of obesity and related chronic diseases. One of the common barriers to weight loss is the uncomfortable sensation of hunger that drives overeating and makes dieting fail. The study is based on Dr. Fuhrman’s clinical experience which clearly suggested that enhancing the micronutrient quality of the diet – even in the context of a substantially lower caloric intake – dramatically mitigates the experience of hunger in his patients. A diet high in micronutrients appears to decrease food cravings and overeating behaviours. commonly interpreted as “hunger”, disappear gradually for the majority of people who adopt a high nutrient density diet, and a new, less distressing, sensation (which the researchers label “true” or “throat” hunger) replaces it. It is well documented [1-4] that a diet low in antioxidant and phytochemical micronutrients leads to heightened oxidative stress and a build-up of toxic metabolites (substances formed in or necessary for metabolism). It has also been shown [5-10] that a higher intake of nutrient rich plant foods decreases measurable inflammatory by-products. 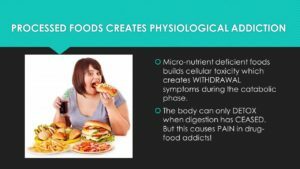 It is thought that a diet containing an abundance of processed food and low in micronutrient-rich plant foods can create physical symptoms of withdrawal when digestion ceases in between meals. There are two stages of digestion, the anabolic stage which occurs when you are eating and then digesting, and the catabolic stage which begins when you stop eating and your body begins to repair and heal any damage. The contention is that during the catabolic phase of the digestion and refeeding cycle, when digestive activities cease, these withdrawal symptoms, misperceived as “hunger”, develop from a diet that is inadequate or poor in micronutrients. These symptoms are called “toxic hunger” by the research team. A “dopaminic high” [11,12] from ingestion of high calorically concentrated sweets and fats has been documented and leads to subsequent craving of these foods. It is speculated that the discomfort of withdrawal from the toxins mobilised when one tries to refrain from consumption of pro-inflammatory processed foods and animal products may be also be a major contributor to compulsive eating and consequent obesity. Dietary micronutrients such as antioxidants and phytonutrients are required for the body to properly reduce the production and removal of metabolic waste products. Healthful eating appears to be more effective for long-term weight control because it modifies and diminishes the sensations of withdrawal-related hunger, enabling overweight individuals to be more comfortable even while consuming substantially fewer calories. This study provides important insights into hunger in a society characterised by over-consumption of processed food with an excess of calories and deficiency of micronutrients. 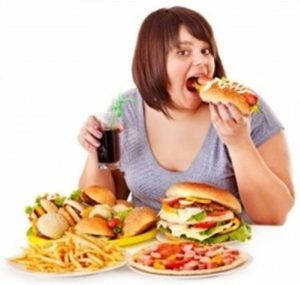 Such hunger creates a cycle of overeating leading to obesity and is an obstacle for those who attempt to establish a healthy eating pattern and normal BMI. 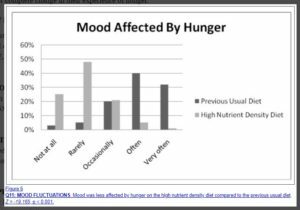 The uncomfortable physical and emotional symptoms of hunger were much less prevalent after a change to the high nutrient density diet. 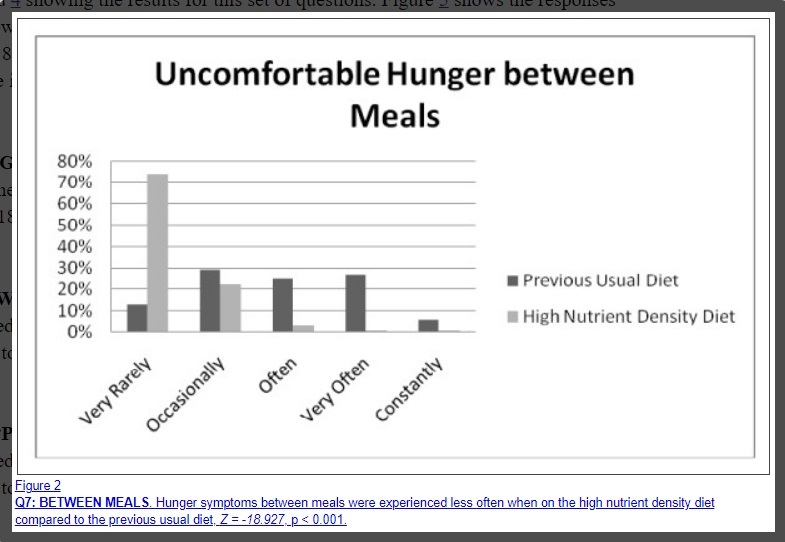 Those who are able to make the change to a high nutrient density diet experienced uncomfortable sensations of hunger less often than they experienced on their previous usual diet. This may explain the previously reported  high levels of compliance and successful weight loss with the high nutrient density diet. Their hunger was less often characterised by classic withdrawal symptoms such as headaches, tremors, stomach cramps, and mood changes. Rather, it was more often felt as a throat sensation that was easily tolerated. As soon as the intake, digestion and assimilation of food is complete, the catabolic utilisation of glycogen reserves and fatty acid stores begins. Hunger normally increases in intensity as glycogen stores are diminishing toward the end of glycolysis (the breakdown of glucose by enzymes, thus releasing energy), and should not occur at the start of the catabolic phase when glycolysis begins (see glucose response curve diagram below). The contention of the researchers is that the uncomfortable symptoms that drive overeating behaviours early in the catabolic phase should be recognised as withdrawal symptoms from a sub-optimal diet and not true hunger. After the completion of digestive activity, during catabolism, the mobilisation and elimination of cellular waste products are heightened, thus precipitating symptoms commonly thought to be hunger. In contrast, true hunger occurs much later when glycogen stores near completion, preventing gluconeogenesis (the utilisation of muscle tissue for needed glucose once glycogen stores have been depleted). True hunger protects lean body mass, but does not fuel fat deposition. It exists to protect lean body mass from utilisation as an energy source. When a diet is low in dietary antioxidants, phytochemicals and other micronutrients, intra-cellular waste products such as free radicals, advanced glycation end products, lipofuscin, lipid A2E, and others accumulate [9,19]. Other studies have demonstrated an adverse impact of low-micronutrient foods containing higher amounts of simple carbohydrates, fats and animal products on levels of inflammatory markers, metabolic by-products and oxidative stress in the body [20,21]. It is well established in the scientific literature that these substances contribute to disease [22-25]. And that they can be associated with typical withdrawal symptoms, including headaches [26,27]. Heightened elimination of these waste products may create symptoms that can be experienced similar to withdrawal from drug addiction . In the absence of an adequate intake of phytochemicals and other micronutrients, cellular detoxification is impaired  which elevates cellular free radical activity, priming the body with more substrate to induce withdrawal symptoms when digestion ceases. The theory is that the above uncomfortable symptoms, relieved by eating which halts catabolism and arrests the detoxification process, are widely misperceived as hunger. In a society with an abundance of fast food and high rates of obesity, commonly experienced sensations of hunger may actually be symptoms of withdrawal from a diet that is inadequate in micronutrients. Such a diet creates an excess of pro-inflammatory metabolic waste products as well as an addiction syndrome. There is growing evidence that food addiction is a clinical pathological condition [30-43]. The results both from this small study and from Dr. Fuhrman’s clinical experience suggest that this addiction is caused by withdrawal symptoms being misread as hunger from pro-inflammatory foods and can be mitigated by consumption of a diet high in anti-inflammatory micronutrients found in vegetables and other micronutrient-rich plant foods. Evidence suggests that overweight individuals build up more inflammatory markers and oxidative stress when fed a low nutrient meal compared to normal weight individuals [20,21]. The heightened inflammatory potential in those with a tendency for obesity is marked by increasing levels of lipid peroxidase (the process by which free radicals “steal” electrons from the lipids in cell membranes, resulting in cell damage) and malondialdehyde (a highly reactive compound that occurs naturally and is a marker for oxidative stress) and reduced activation of hepatic detoxification enzymes (these liver enzymes help neutralise and convert toxins into less harmful byproducts, which can still pose a toxic threat to the body if not removed efficiently)..
People prone to obesity get more withdrawal/hunger symptoms, preventing them from being comfortable in the non-digestive (catabolic) stage where breakdown and mobilisation of toxins is enhanced. The resulting uncomfortable symptoms drive them to eat again and over-consume calories. It is a vicious cycle promoting continuous (anabolic) digestion, frequent feedings and increased intake of calories. Chronically overweight people in the typical American food environment feel “normal” only by eating too frequently or by eating a heavy meal, so that the anabolic process of digestion and assimilation continues right up to the beginning of the next meal. Excess calories are needed in order to feel normal. A review of research on companion animals suggested that the introduction of specific micronutrients positively influenced the health status of animals whose natural detoxification systems were compromised, and reduced the accumulation of inflammatory markers . 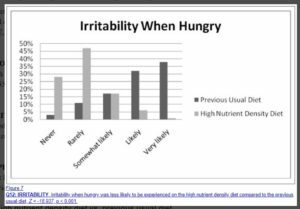 This may explain why those on the high nutrient density diet were able to go for longer periods without feeling “hunger” symptoms. One theory that has been investigated is the glucostatic theory which links dynamic changes in blood glucose with appetitive sensations [45-48]. Several studies have explored the relation between the glycaemic index or fibre content of food and satiety, whereas others have examined whether the type or amount of fatty acids, sugars or protein in the diet affect the sense of hunger [49-62]. Results have been inconsistent. This may be due to the unknown variable of micronutrient intake in these studies. Some studies have documented a decrease in appetite with ingestion of greater amounts of fibre and/or micronutrients [49,52,56]. A Canadian study found that fasting and postprandial appetite ratings were reduced in women who were supplemented with multivitamins and minerals . 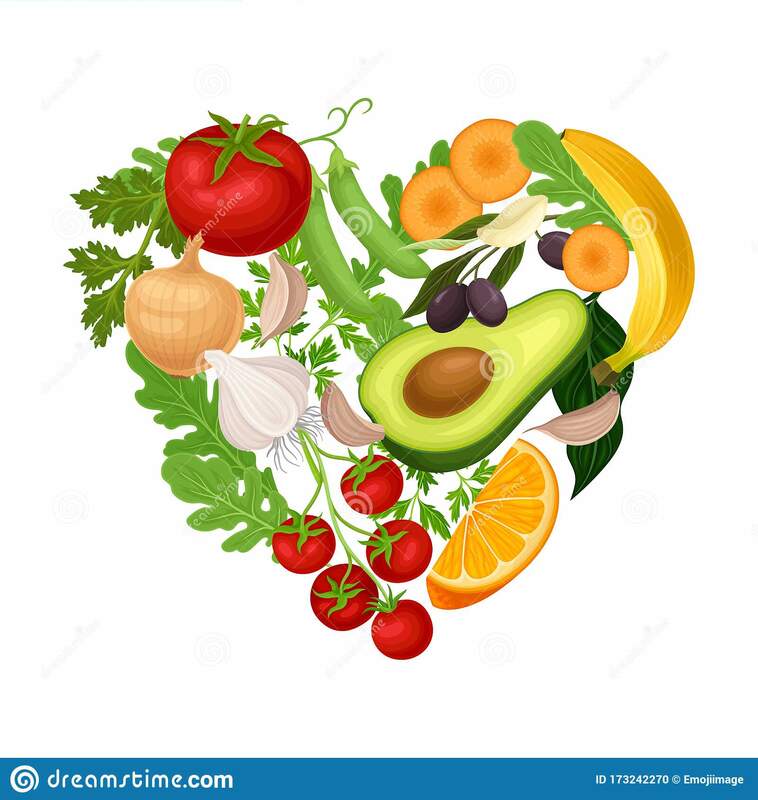 Highly significant reductions in blood pressure, LDL cholesterol, fasting glucose and body weight have been reported in persons who have made the change to a high micronutrient diet . There is a vast body of research documenting the protective benefit of a micronutrient-rich diet against cancer and cardiovascular disease [1,8,10,24,25,64-77]. 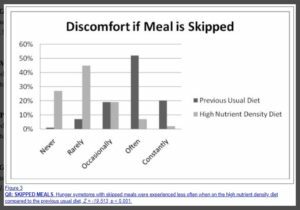 If clinicians can assure their patients with confidence that they will not experience uncomfortable sensations of hunger after the “detoxification” stage is over, they can keep their patients motivated to withstand the withdrawal symptoms they experience early in the dietary transition. The outcome will be not only substantial and sustainable weight loss, but prevention of many major chronic diseases in patients. There are limitations in this study, but the number of participants and highly significant test statistics provide leads for future studies that are better controlled and prospective in design. It also provides some important clinical insights that can be studied in more detail. The physiological and neurohormonal correlates of “toxic hunger” and of “true hunger“, including measures of oxidative stress and ghrelin levels (nicknamed the ‘hunger hormone’ because it stimulates appetite, increases food intake and promotes fat storage) in people who adhere to the high nutrient density diet and the previous usual diet. How long the typical “withdrawal phase” from the previous usual diet lasts as people shift to the high nutrient density diet. This information would be valuable in clinical efforts to support those who are making the change to healthier eating patterns. Significant differences were found in the symptoms, location and unpleasantness of hunger on the high nutrient density diet compared to the participants’ previous usual diet in a large sample of people who had made the shift to a diet high in micronutrients and lower in calories. It is not simply the caloric content, but more importantly, the micronutrient density of a diet that influences the experience of hunger. 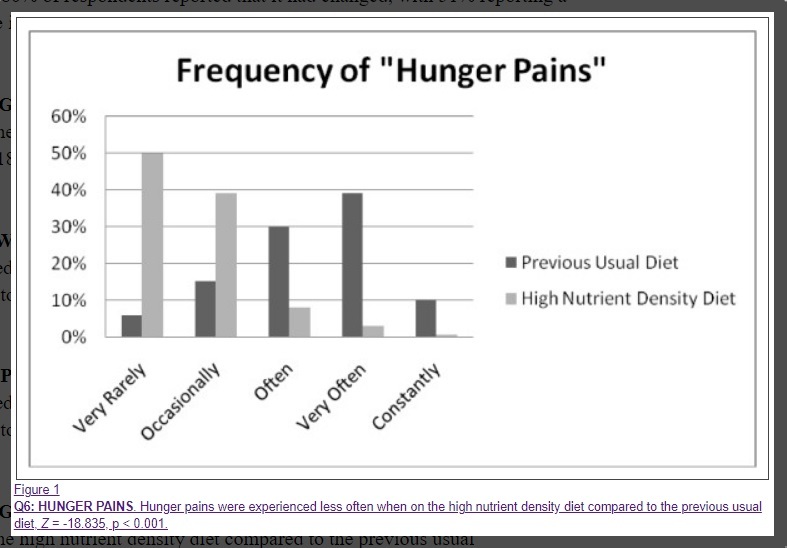 There is an initial phase of adjustment after transitioning from the usual diet to the high nutrient density diet, during which a person experiences “toxic hunger” due to withdrawal from pro-inflammatory foods. A high nutrient density diet can result in a sustainable eating pattern that leads to weight loss and improved health. Further studies are needed to confirm these preliminary findings. These findings may have important implications in the global effort to control rates of obesity and related chronic diseases. There is an optimal dietary intake of sufficient antioxidising, anti-inflammatory, antiangiogenic micronutrients. Given the foregoing, I believe that the body will heal itself and maintain optimal health if given appropriate nutrients. However, if the body is bombarded with toxic “food”, then it will be continually struggling to reach homeostasis – resulting in symptoms such as those described in the study. Our brains learn to tell us one thing (that we are hungry) while our body is telling us another (that it’s full of toxins and needs to remove them). In the majority of cases nowadays, it appears that the brain wins this battle – as can be seen by the explosion in cases of obesity and diet-related diseases. I have noticed a change in hunger pangs since transitioning to a WFPB diet. Previously, I would experience cravings that simply had to be satisfied – cakes, ice-cream, takeaways, etc seemed like the only solution to a problem over which I had little conscious control. I now experience almost no hunger pangs like this. Eating has become something calm and therapeutic. This is echoed by what I hear reported by friends, family and clients who have similarly made the transition to a WFPB diet. When we eat foods that are in harmony with our biochemistry, toxins, cancerous cells and fat deposits no longer build up and linger in the body. We feel healthy and the brain is not therefore sent on a wild goose (or chicken McNugget) chase in search of quick dopamine fixes to relieve the bodily discomfort caused by a low-nutrient/high-toxin diet. ANDI measures calcium; the carotenoids – beta carotene, alpha carotene, lutein, zeaxanthin, and lycopene; fibre; folate; glucosinolates; iron; magnesium; niacin; selenium; vitamins B1 (thiamine), B2 (riboflavin), B6, B12, C, and E; and zinc, plus the ORAC (oxygen radical absorbance capacity) score X 2. 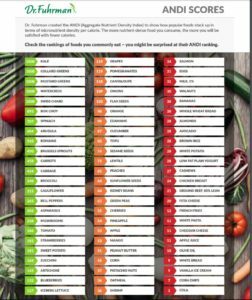 Most importantly, the ANDI scores are based on calories, not volume or weight of food, so a lower-calorie food with more nutrients scores higher than a calorie-dense food, which is why foods like iceberg lettuce and kale score high. Gibbons JD. Nonparametric statistics: an introduction. Newbury Park, CA: Sage; 1993. Next Next post: What Will Your Last 10 Years Look Like?